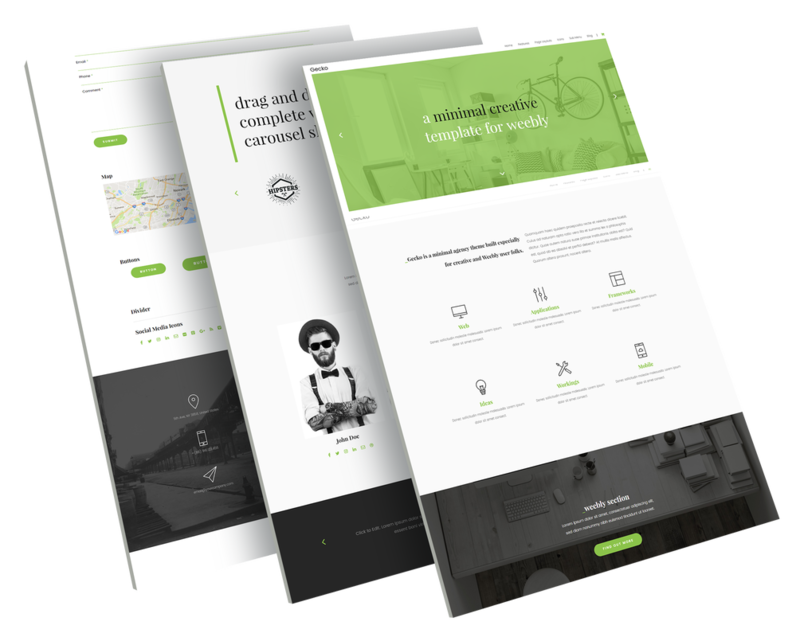 Gecko is a Modern & Minimal Weebly Template that will help you to showcase your business or services in a subtle and minimal way. ​color or Video Backgrounds and has enhanced ecommerce functionality. Not to mention tons of other great features. Gecko is 100% tablet and mobile responsive which means it works seamlessly on all viewing devices, from large Tablet to small Iphone Gecko looks awesome. Weebly 4 Sections are awesome. If you want to change background image, color or add a video, you can do it in a breeze with click to upload images and color pickers. Gecko is the first Weebly Template to offer Multi Page and One page Scrolling menu in the same template. No need for extra apps here, simply switch between the 2 styles from the theme options. Weebly 4 Ecommerce features are fully supported within Gecko. Use Gecko to run a successful online store. Don't need a store? Simply turn off the cart using the theme options..
Gecko includes theme options that let you make simple and quick customizations to your theme. Turn On/Off sections you dont want right from the Weebly dashboard. Having trouble with inspiration for a section on your page? Select from a range of pre-styled content ready sections. simply drag in any weebly widget and your off! 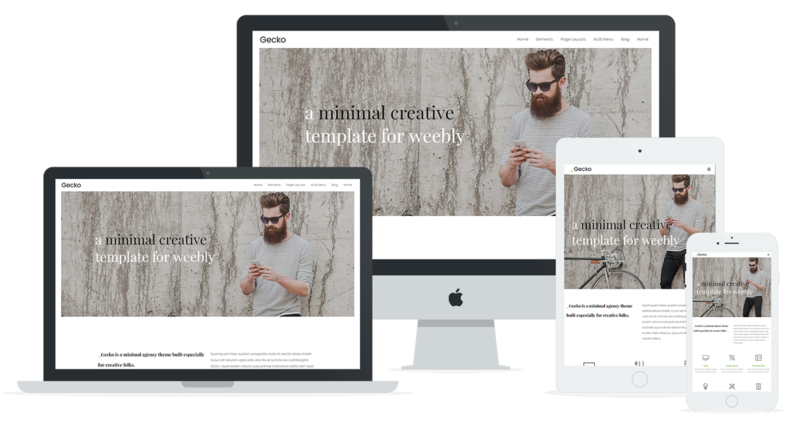 To say Gecko is a minimal Weebly Template it packs a punch and you're definitely getting your money's worth. Before you take into consideration the amazingly well crafted and optimized code used for this theme (giving you a technically exceptional template), and not to mention the delicately styled homepage header. Just take a look at the features list to realize how much you are getting for your money. We've really gone the extra mile with Gecko. Not only can you chose between a single page or multi page menu, you can select from one of three beautifully designed homepage headers, with pre-built drag and drop sections, Image sliders, Content carousels, testimonial scroller, animated headers and more. It's hard not to get excited about the thought of building your website with Gecko, it's like no other premium Weebly theme on the net. And the first of it's kind with our custom interactive animated header. This is a Minimal Weebly Theme that has a huge amount to offer, and if you want a clean and modern website with the style of something designed by the professionals, Gecko is the perfect choice for you. Please note, the demo website shown using Kudos is purely a demonstration of a website built using the Kudos Theme. Demo Content, Section Layout, images and anything else you see on the demo site is not included with the theme. If you have a brand new website and want us to setup your homepage to mirror our demo website, please raise a ticket and we will provide a quote.